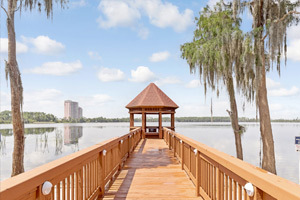 Located in Orlando, Staybridge Suites Orlando/Lake Buena Vista is a 3-minute drive from Walt Disney World® area and 6 minutes from Orlando Vineland Premium Outlets. This family-friendly hotel is 2.1 mi (3.4 km) from Disney Springs® and 4.1 mi (6.6 km) from SeaWorld® Orlando. Make yourself at home in one of the 150 air-conditioned rooms featuring kitchens with full-sized refrigerators/freezers and stovetops. Your room comes with a pillowtop bed, and all rooms are furnished with queen sofa beds. Wired and wireless Internet access is complimentary, while iPod docking stations and cable programming provide entertainment. Conveniences include laptop-compatible safes and desks, as well as phones with free local calls. Be sure to enjoy recreational amenities, including an outdoor pool, a spa tub, and a fitness center. Additional amenities at this hotel include complimentary wireless Internet access, concierge services, and an arcade/game room. Spending a day of fun is easy with the complimentary theme park shuttle. Grab a bite from the grocery/convenience store serving guests of Staybridge Suites Orlando/Lake Buena Vista. Mingle with other guests at the complimentary reception, held on select days. A complimentary buffet breakfast is served daily from 7 AM to 10:30 AM. The preferred airport for Staybridge Suites Orlando/Lake Buena Vista is Orlando, FL (MCO-Orlando Intl. ).